The Eli Review Curriculum Repository makes available a range of materials that teachers can utilize in their classrooms. Everything is free: these materials are presented with the intention that they be taken up and put to use as widely as possible. Adapt and reuse: these are all presented as recommendations, but they should always be tailored to fit the unique learning needs of your students. Use with or without Eli Review: these materials are all based in learning theory and writing theory, which means they’ll work regardless of technology. But using them with Eli will make teaching more effective and yield better results. The options with each task in any curriculum resource. If you aren’t logged into Eli Review, you’l be asked to sign in. 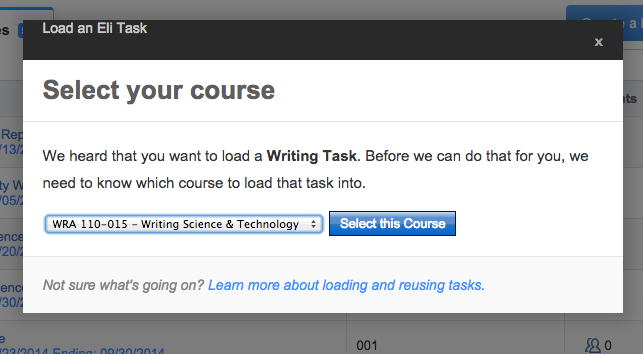 If you have more than one course, you’ll be asked to pick which course you want to use this task with. Eli asks you which course you’d like to use the task in. If you’re already signed in, and if you only teach one course, you’ll be taken to a display where you can modify the task before assigning it to your students (see “Modifying Tasks” below). Clicking this button will let you print each individual task. From there, you could make copies of it to distribute to your students, which is useful if you want them to respond to that writing prompt or use a review as a rubric. Other print options in the curriculum include a “Print Section” option, which will print all of the content in a whole section, or a “Print All” option, which will print the entire curriculum (be careful, though, because there is a lot of content in some of them!). Once you’ve found the task you want in the repository, modify it however you need. Titles: all tasks were named by their designers and include hashtags. You can easily rename and remove those hashes if you prefer. Review materials – you will always be asked to specify what students will review as part of a task, so you’ll need to do that before you can assign the review. Review groups – curriculum tasks do not have a pre-defined student grouping, so you will need to arrange your students into groups how you see fit. Anonymity – all reviews have anonymity turned off by default, so be sure to check this option if you want to keep review feedback anonymous. The authors of these individual materials retain ownership of them. However, all of the materials are licensed under a Creative Commons Attribution-NonCommercial 4.0 International License. This means you are free to copy and redistribute them in any medium or format and to remix, transform, and build upon the material, as long as you provide proper attribution to the author. Commercial use of this content is prohibited. To find out more about how to get Eli Review for you and your students, see the Get Eli Review site or contact [email protected].